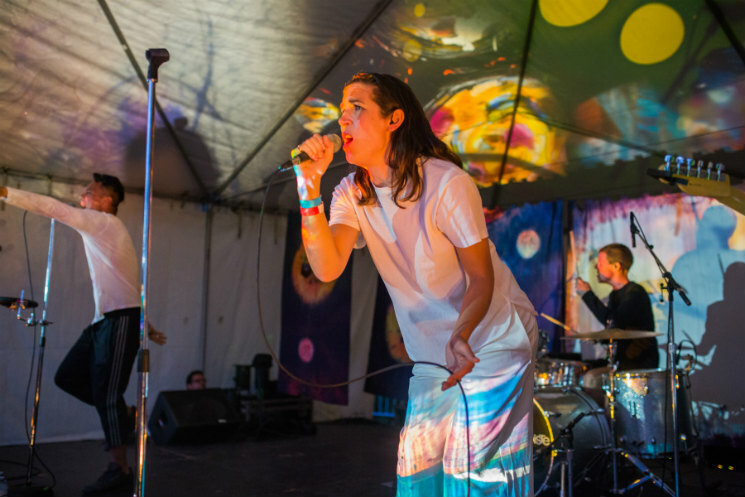 There was an unexpected poetry to Young Galaxy's performance at Camp Wavelength on Sunday (August 21), when the band closed out the second edition of the festival. Hearts were still tight from Gord Downie's final performance with the Tragically Hip the night before, an event that was broadcast across the country and made Canadians think about the temporality of life, the joy of music and the pains of losing a national treasure. The Hip and Young Galaxy would rarely get mentioned in the same sentence — the bands sound nothing like each other — but the proximity of these two events gave Young Galaxy's performance a surprising urgency and heaviness, as if the previous night's events had reminded everyone how important it is to make and enjoy music while you can. Young Galaxy have become a national treasure in their own right, though. Five albums into their career, they have never misstepped, and have established themselves as masters of dream pop. The band rolled through their deep well of material with a certain comfort and precision that only comes from years of experience being on stage. As the first performers of the day that really succeeded at getting the crowd dancing — and many had tried — they made their performance seem light and effortless, when it was anything but. When the stage temporarily lost power part way through the set, Catherine McCandless continued performing in a cappella and actually managed to pull it off; that's how powerful her voice is, and how much this band brings to the table when they perform. The audience left feeling full of joy and optimism for the future, as if Young Galaxy were placed there on Sunday to say "It's going to be alright."